Well the Chew Pike Boat Trials are over for another year and as usual, they produced plenty of 30's and loads of 20's. The final 6 day session was dominated by bait anglers, but a 36lb 5oz cracker couldnt resist a lure - sadly it wasnt one of mine! I fished the final 2 days with Ian Gregg, Stuart Clough and Keith Hendry. We fished lures on the drift but to no avail. So we anchored and fished static baits and wobbled smelt. Over the 2 days, we had 10 pike - 6 to the wobbled baits and the other 4 to static deads. Ian had 3 mid doubles, with Keith a 16 pounder and Stuart Clough a superb 25lb 8oz esox. I only had 2 fish but one weighed 27lbs and became my biggest of the Autumn Pike Trials. The other weighed 8lbs and what made it interesting was that it had one of my Tags in it's dorsal fin - put there the previous day when Ian Gregg caught it about 100 yards away! That makes it 660 pike to my guided boat sessions since opening day in March 2010. Guiding on Litton during the Winter. Now that the 2011 season is over on Chew and Blagdon, I am still available to guide on Litton lakes - just 10 minutes drive from Chew. There are 2 reservoirs at Litton with boats on each and a superb Fishing Lodge to cook up some warm food on a cold day. Chew Valley's brown trout record has been well and truly smashed by the capture of a 22lb 7oz monster. Believed to be the biggest grown-on brown trout from any reservoir in the UK, this fantastic specimen was returned unharmed to the water. The potential record fish was caught after the 15th October; a time when all brown trout must be released by law. It was banked by pike angler Justin Harrington on a deadbait during the 3rd session of Chew Valley Pike Trials from the North Shore. The pictures show it to be in absolute fin perfect condition and apparently it fought well, but went back well after recovering. We always thought that the Chew brownies might be capable of such sizes, particularly in recent years when so many big browns have been landed. I am sure that these leviathans are Ferox Trout that change their eating habits to that of live and dead fish - there are certainly plenty of roach and perch for them to feed upon. Last season I had an 11lb Brown Trout which would not recover as I tried in vain to release it. It was an old fish, but I wanted to return it. Alas, it went belly-up, so I took it to the local smoke house where we discovered it had 6 small roach in it's system - all in differing stages of digestion. So perhaps we have a new species to target on Chew Valley - the Chew Valley Ferox! Who knows, they might be feeding on the Chew pike!?! Wayne Adcock had a day to remember on the Annual Chew Pike Competition held on the 1st day of the 3rd session of Pike Trials. Wayne drew top predator angler Neville Fickling and landed fish of 33lbs, 27lbs and 29lbs, plus a couple of doubles for good measure! Adcock's total weight was over 100lbs and easily took the trophy. Deadbaits at anchor was the winning method and 2nd placed Martin Harrison also fished deads to take 5 doubles for almost 70lbs. I was drawn with top lure angler Bob Jones and we were really excited as the winds were low and the air temperatures comfortably warm - some pike were even showing on the surface as they targetted the roach - we were very confident that this would be a day for the lures. How wrong we were! After 15 minutes I had a good hit and landed a 7 .08 fish, soon followed by a couple of jacks for Bob and I in quick succession. Then it was a case of sit back and watch the deadbait anglers heaving in pike after pike. Returning to the Dam, I had a 10.08 fish and expected things to start happening for us - but they didn't. Bob and I persevered however and at last knockings, I managed a 25.08 beast off Moreton point - a gnarly old campaigner which was blind in one eye! Although I have supreme confidence fishing lures for pike on Chew in virtually any conditions, there are times when I stick the anchor down and watch the floats. To me, fishing deads lacks any interaction and apart from twitching them along the bottom from time to time, you are literally at the mercy of the pike and cannot make things happen as you can fishing lures or flies. Still, each to their own I suppose. On this particular day, I was fishing with Barry Hawyes, who this time last year, lost the biggest pike I have ever seen on Chew Valley - right at the net - in fact, 2/3's of it's body was over the net before it slunk off into the depths! Barry has never been the same since! As it was cold and windy, we drifted with lures for a few hours and Barry had a couple of jacks. Lunchtime came, so we anchored-up and stuck out 3 baits while Barry continued to fish the lures. Within 10 minutes, he had missed a take and landed a 7lb fish. The boat near to us had a decent fish, so we felt we too were in with a chance. Sure enough, Barry's float started to move, so he wound down and struck into a solid fish. After a decent fight, we got the fish into the net, just as my bait runner screamed off. I struck into another good fish and to cut a long story short, we had 2 fish in the same net weighing 47lbs! Barry's fish was 20lbs 8ozs and mine was 26lbs 8ozs. Thankfully both were lightly hooked and went back quickly after a couple of pics - the rigs however were a different story and needed completely replacing. We went off on the drift for the rest of the afternoon but returned for last knockings, where I managed another cracking fish of 24.08, while Barry had a jack and lost another biggie. The 2nd session of Chew Valley Pike Trials were marred by vandals who set fire to some of the boats on Sunday evening, causing over £25,000 of damage. Six boats and 5 outboard engines were totally ruined by this senseless act of vanalism. Thankfully, a visiting pike angler spotted the fire and called the fire brigade, otherwise the result could have been catastrophic. It was a sickening sight on Monday morning, seeing the burnt-out carcasses of the boats, with charred remnants of the wooden gunwales and transoms floating around on the surface of the lake. The fibre glass hulls burnt so savagely that the engine mountings disintegrated and the engines dropped into the lake. The recovered engines were ruined. Pike session number 2 off to a great start. The previous 2 days had been excellent, with light winds and warm air temperatures. More pike fell to deadbait tactics than in the first set of trials, but still the lure anglers were making the headlines. Two visiting lure fishers drifted over the deep water on Monday and although the winds were near gale force, boated fish of 22lbs and the biggest so far at 32.08 - both taken on spoons. I fished the first 2 days and had 3 twenties - a 20.08, 23.04 and at last knockings on Sunday evening, a fin perfect fish of 24lbs 8ozs. All took slowly fished soft plastic lures using a Greys Prowla medium Lure rod, a Shimano Rarenium reel, loaded with 50lb Power Pro braid. I really enjoyed being on Sky TV's Tight Lines programme last friday night. Keith Arthur and I chatted about Chew, Blagdon, trout and Pike - both with flies and lures. If you missed the programme, then you can download the entire Pod cast from the Tight Lines Website. I fished the first day of Pike Trials on Chew Valley Lake this Monday - what a day it was! 70 degrees heat and bright sunshine greeted the boat anglers - most of whom anchored and fished deadbaits. This was definitely the hottest ever start to a pike trials session and my boat partner, Simon Pledge and I headed for Herons Green. Our other friends Gavin and Gary also headed for this area - all of us determined to fish lures on the drift. Thankfully, most of the anchored boats kept to the deep water in front of the Sailing Club or in front of Woodford Bank. The 4 of us ended the day with over 40 pike on lures. Simon had the best bag - his first three pike weighed 20lbs, 24lbs 8ozs and 26lbs. Gavin Young had fish of 23lbs, 23lbs 08ozs, 19lbs and 17lbs 08ozs. Gary and I also chipped in with several doubles up to 14lbs. Today I ran a Corporate Flyfishing Day at Testside lakes in the Leckford Valley during the hottest day of the year! I cannot remember a hotter day this season apart from the World Championships - and they were held in Italy! Temperatures soared to over 80 degrees farenheit in many parts of the UK and in just 2 days time, we begin the Pike Trials on Chew Valley lake. I fly fished for pike yesterday and the previous day on Chew and it was very hard - we managed just 3 jacks but saw some massive fish. The trout fishing recently - and all through the season - has been amazing on both Chew and Blagdon Lakes, but even the trout have been hard to tempt over these past few days. On the River Test, during this afternoon, there was not a single rising fish. The lakes at Testside fished exceptionally well during the morning and early afternoon, but come 4:00pm, even these fish had stopped feeding. Is this the effect of Global Warming? Will this be the norm for our coming Autumns? Who knows? I bet that by Monday, the present spell of windless, hot, sunny weather has passed and is replaced by cooler, windy weather - and for once - just once; I will be relieved. And so, I hope, will the fish. I bet the pike trials will be brilliant and the trout fishing at the back-end on both Chew and Blagdon; will also be superb. 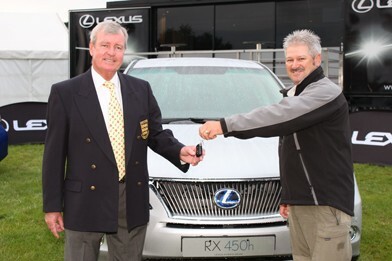 Dave Lang was yesterday crowned Lexus Champion for 2011. Chew Valley fished incredibly well on the practice day, with some anglers recording as many as 20 fish. The match day saw plenty of rain, but light winds meant the fish kept feeding, but they were far harder to tempt following the hammering they received during practice! Top rod Dave used a combination of 2 Boobies, with 2 nymphs sandwiched in between - proper "washing Line" tactics utilising a Midge Tip fly line. Not one of the 100 competitors managed their 10 fish limit, but Dave Lang and Kieran Bonas both weighed-in 9 rainbow trout. It was quite a day for runner-up Kieran Bonas, who isn't legally able to drive until October when he reaches his 17th birthday. Already, the youngster won the Rutland Water Heat, beating a star-studded cast of older anglers and in the Final, he very nearly did it again. There is no doubt that this young man is destined for great things and we all wish him the best of luck in the coming years. Tomorrow I head for Milan and then on to the Dolomite Mountains for the 2011 World Flyfishing Championships. Torrential rain has seen a change in one of the River sessions, as a landslide has forced one of the Aurino River sessions to be transferred to the Rienza. This is a great shame, as the Aurino is a fantastic river, with lots of big Marble Trout and Grayling. These championships promise to be one of the best ever ......... or one of the worst. Everything hinges on the weather - too warm and the snow melt will colour the rivers - too wet and the rivers will turn chocolate brown. Last year it rained in Poland and I managed a bronze medal - this year, as long as we get a team medal, I really don't care what the weather throws at us! You can follow the results as they happen on the official FIPS MOUCHE web site. I will let you know how it all went in early September. Until then, good fishing and Tight Lines. Just 4 days to go before the new Lexus Champion is crowned. 100 anglers from all over the UK, plus the Czech Republic, France and Belgium will descend upon Chew Valley Lake near Bristol to compete for the ultimate prize in competition fly fishing - a brand new Lexus RX450 hybrid SUV worth over £50,000. The person catching the biggest fish at the Grand Final will also win a holiday to Norway in 2012, courtesy of Anglers World Holidays. Chew has been in superb form all season, but last week saw a green algae bloom which curtailed sport for a while. Thankfully, the winds and rain of the last few days have dropped the algae out in many parts of the lake and the introduction of 4,000 rainbows will hopefully have stirred the resident fish into action. By Thursday, as long as weather conditions are favourable, we should be in for a cracking match. The last 2 Lexus Heats were held at Grafham Water near Cambridge and Draycote Water near Rugby - both had been fishing well all season, but for the Lexus Heats they were very tricky. Just 6 fish was sufficient to win the day at Grafham, while Craig Barr's 8 took the honours at Draycote. The day before the Draycote Heat, I fished a guided day there with my good friend Barry Hawyes and we managed 8 to the boat between us. The tactics were either Dry Flies, targetting the fish that were moving on top, or a team of nymphs using a 20 foot leader for the other band of trout that were feeding deep. We had heard of Draycote's reputation for big fish this season and Barry had the best fish at almost 6lbs - see pic. It was a fin perfect specimen and reminiscent of a New Zealand rainbow trout. It's always a red letter day when someone catches their Personal Best fish on a fly, but when that man happens to be the Chairman of the PAC - it's even better! John Synnuck has caught far bigger fish around the Globe than I have, but earlier this week, he recorded yet another milestone with a 21lb 4oz pike on the fly - and he's only been fly fishing seriously for about a year! John has actually had plenty of doubles on the fly from Chew, but somehow the big girls have evaded him - but not any more. I was fishing with John early last season when my 30 pounder gave me a present that required 4 stitches, so between us we now compare scars! Well done John, I fully expect you now to crank up the weights and look forward to our next trip. Now that the winds have dropped, both Chew and Blagdon are fishing brilliantly again right on the top. Surface rising fish have appeared as if by magic now that the conditions have improved and dry flies are working well - at last! Blagdon has massive trout working the marginal weedbeds along the South shore and Denny Island keeps producing the goods on Chew Valley. Yesterday on Chew, trout moved into the Moreton bank area for the first time in weeks and fish could be seen dimpling all across the middle of the lake. Right in front the Lodge on Blagdon is an area where moving trout can be found and boy are they big! Make sure you have some strong tippet material if you fish either lake in the coming weeks! If you fancy a late season competition day, then why not try the Lexus Heat at Draycote Water near Rugby. For weeks now, Draycote has produced masses of huge fish since re-opening following a year's closure. On 31st July the final Heat of the Lexus European Flyfishing Championships will be held on Draycote Water and already, 22 of the 30 places have been sold. Due to popular demand, Draycote water near Rugby has been added as the final Qualifying Heat of this year's Lexus individual Championships. The Heat will be held on 31st July and there are 30 places up for grabs. New Fisheries manager Craig Barr has had his local anglers asking if there will be a lexus Heat on the venue, following the year's closure by Severn Trent and this has prompted the creation of an additional Heat. I too have had competitors contacting me to ask for a Heat at this very popular venue, particularly following it's recent stunning form, where 00's of 3lb plus rainbows have been caught. Congratulations to Tony Bennett and the capture of his personal best ever pike on the fly weighing 28lbs at Chew last week. I fished with Tony a few days earlier and he was snapped by a big fish which we were certain would have been his personal best. Still, he made up for it in real style on his very next trip and I am sure his new aim is one of Chew's legendary 30 pounders! If you are fishing for pike - or trout - please look out for tags on the base of the dorsal fin. They can be covered in algae and even have some weed growth attached, but they are quite easy to detect (once you know where to look). I have tagged over 400 pike and am getting over 10% recaptures - no longer do we have to rely upon faded photograghs and hearsay to know if someone has caught the same fish - we can be certain! So far, the average growth rate for a year is no more than 2lbs - even for big doubles and twenty pounders. This has surprised even me, as I feel sure they are predating mainly on roach and perch. Last week I had a 22lb fish which I caught myself just over a year ago and it had actually lost 2.5lbs. I've included a pic of the above-mentioned 22lb fish, with the tag position clearly shown. Note the bite mark across it's back which extended to the other side as well (would like to catch that big mother soon)! So please log any tagged fish you catch with the weight, date of capture and area caught on the lake. That way, we can build up a picture of recapture rates, distribution and weight increase/loss and have some real evidence on which to base our findings, rather than just the usual speculative nonsense! So far, my findings are pointing to normal annual increases in weight and definitely not those associated with pike predating on 2lb average size rainbows. I was hoping that once the terrible winds that battered us in May and June had subsided, July would bring a return to settled weather - sadly this has not happened. I have just returned from Stocks Fly Fishery near Blackburn and the fishing was tricky - average rod returns from 3 sell-out days were less than 4 per rod and this is a very good and productive venue. It is also superbly managed by Ben Dobson and his staff Matt, Paul and Tom. Some of my friends have also just returned from Rutland Water where they were fishing in competitions and they told me that the fishing there was rock-hard. Chew has also been "iffy" of late, but was just starting to improve again before I left for Stocks. A big stocking seemed necessary to liven things up a bit and that happened 4 days ago. Hopefully this will get the resident fish feeding, most of whom are still being caught around or behind Denny Island. Washing Line or straight-lined nymphs are still the best 2 methods - I simply cannot get the fish up to dries at the moment - even last week when there was a massive fall of flying ants; they seemed very loathe to rise. I think this is due to the fluctuating air pressures surrounding not just Chew, but the rest of the country at present. Next week more unsettled weather is forecast, but at least that means cloud. I have often said that there hasn't been a decent book on fly fishing for trout written since the Pursuit of Srtillwater Trout, written some 20 odd years ago. Well now there is one! A Passion for Trout is a fine book written by Irish angler Mick O'Farrell with photograghs and publishing by top fishing photographer Peter Gathercole. Mick is a life-long trout angler, fly tier and genuine nice bloke - he is also a very fine competiton angler who genuinely knows his stuff. I have fished with and against Mick in competitions such as the European Championships, where we were both representing our countries. The flies are superbly photographed - so often a fault in other fishing books. Gathercole excels here and the patterns are truly up-to-date, incorporating the latest materials. This book will become a reference tome for many and a "must have" addition to any serious fly angler's book case!